Firefighters have battled two large grass fires on mountains overnight, which were spread quickly by strong winds. Crews were at blazes on Maerdy mountain, Rhondda Cynon Taff, where 88 hectares of the mountainside were well alight on Monday evening. A 50-hectare fire in nearby Rhigos was about one mile long. Both fires had been put out by Tuesday morning. One resident said the blaze was a "perfect ring of fire". Rhian Grundy, whose house in Llywcoed, Aberdare, overlooks Rhigos mountain, said: "We saw the fire from the window in our house - it looked like it was in the area of the tower colliery on the Rhigos mountain. "It started as a perfect ring of fire. Within 45 minutes - it went all the way to the top." 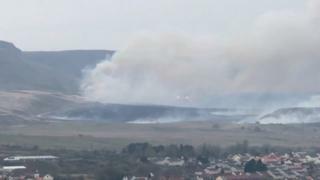 Fire crews also put out smaller blazes in Brynmenyn in Bridgend, Treharris in Merthyr Tydfil, Gilfach Goch in Rhondda Cynon Taff and Pontardawe in Neath Port Talbot.